Make your healthcare wishes and end-of-life choices clearly known! 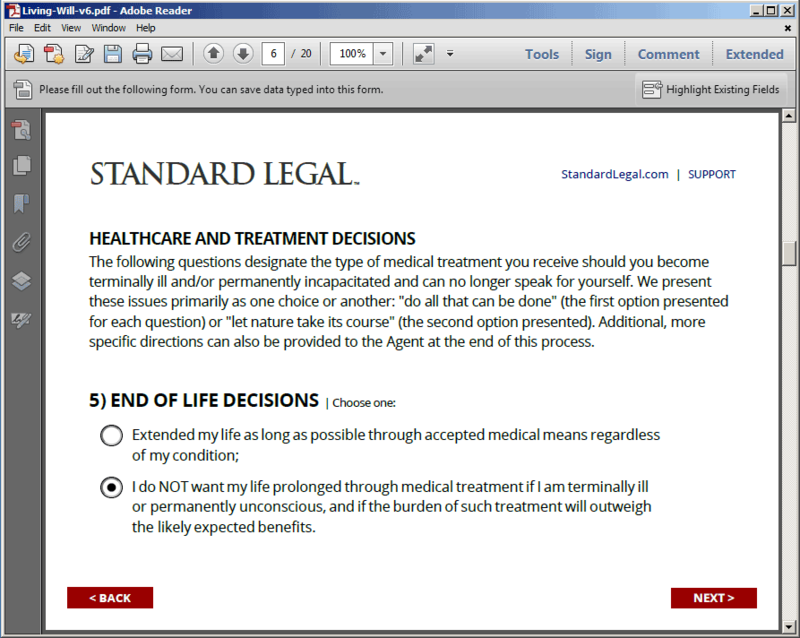 Easily provide detailed instructions to family and friends about your medical preferences using Standard Legal's Living Will software. 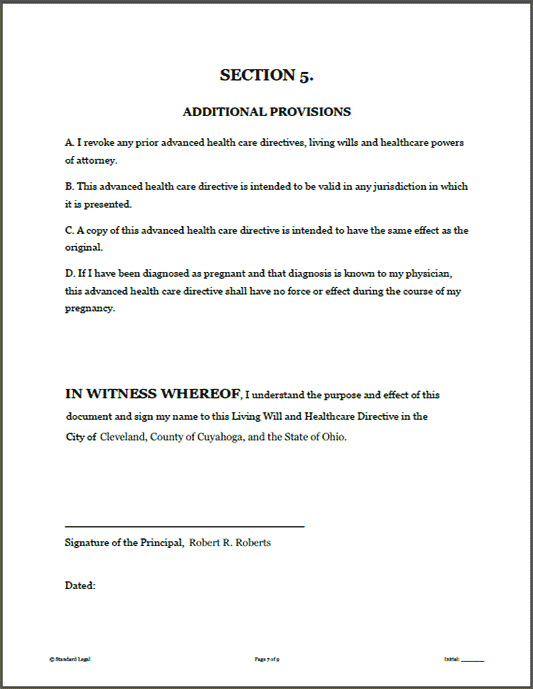 This Advanced Healthcare Directive contains a Living Will with a Healthcare Power of Attorney, plus a HIPAA Release Authorization and a Minor Child Emergency Medical Authorization form. Answer some simple questions and the software will customize a document that outlines your preferred end-of-life treatments and the type of care you want if incapacitated. 18 YEARS IN BUSINESS. MILLIONS OF DOCUMENTS DOWNLOADED. HUNDREDS OF THOUSANDS OF SATISFIED CUSTOMERS. Step-by-Step Simple, Finished in Minutes! HOW STANDARD LEGAL SOFTWARE WORKS: A simple introduction and easy-to-read overviews are presented first. A questionnaire follows. Text fields, check boxes and drop-down menus are used to collect your answers, with additional instructions next to each field if needed. As soon as the questionnaire is finished, the final documents are created instantly: just save and print! It's that easy. Every person should have three critical legal documents as an Estate Plan: a LAST WILL & TESTAMENT to transfer property, a LIVING WILL for healthcare decisions, and a POWER OF ATTORNEY to designate a trusted aide. Now get all three of these documents together in one easy-to-use Estate Plan Essentials software package for just $29.95 -- save 33%! ATTORNEYS & PARALEGALS: This software is licensed for pro se users. See our Professional Edition to create client documents. 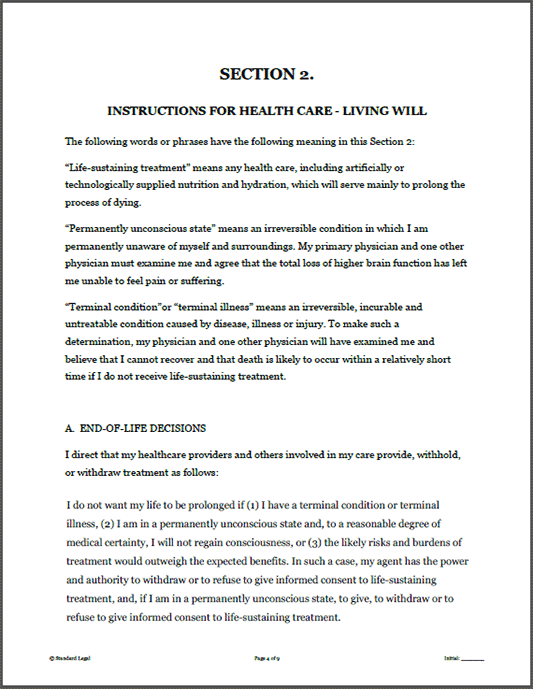 A Living Will is an important healthcare document. 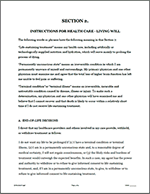 It allows you to clearly spell out to your family and trusted friends EXACTLY the steps you want them to take -- and EXACTLY the steps you DO NOT want them to take -- should you become seriously ill, seriously injured, or incapacitated. And quite candidly, some Living Wills are better than others. In the past, Living Wills were often brief and did little more than discuss life support situations, leaving many issues up for consideration or debate. 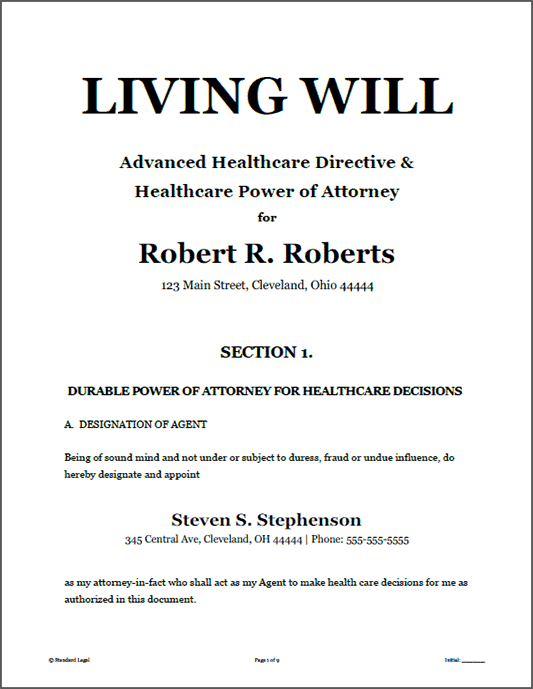 Today, the more accepted document is an Advanced Healthcare Directive, which combines the end-of-life designations of a Living Will with the ability to name an Agent who can oversee treatment if need be through a Durable Healthcare Power of Attorney. 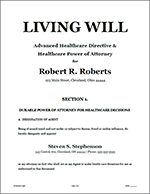 Combining these documents covers nearly every medical, jurisdictional and life support situation, and allows the Principal (the person making the Living Will) to choose an Agent in advance who will make life and death healthcare decisions on his or her behalf. 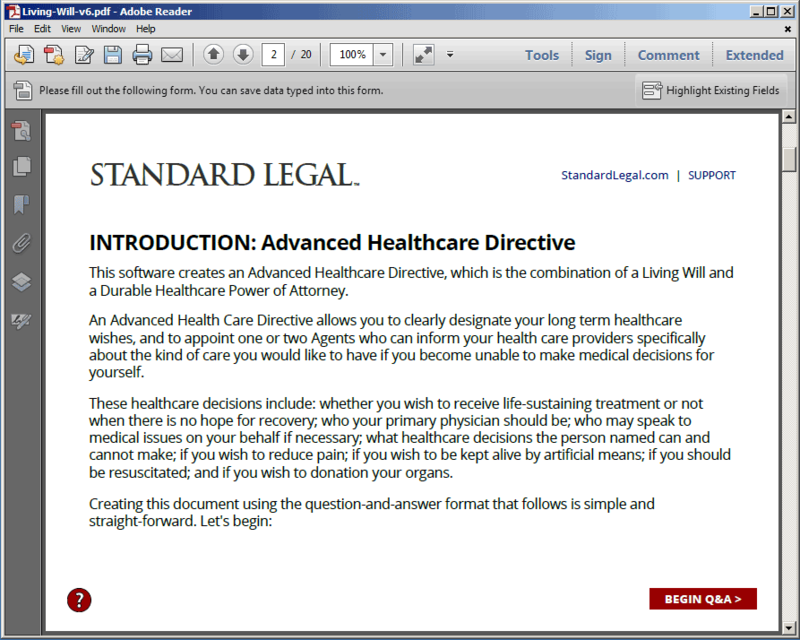 Standard Legal's Living Will software provides this comprehensive Advanced Healthcare Directive combination, which is legal and valid in all USA states. 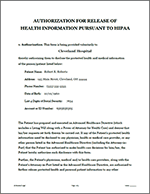 The software also contains a HIPAA Medical Records Release Authorization form. HIPAA, the Health Insurance Portability and Accountability Act of 1996, imposes privacy rules on how and when a medical provider can disclose information about its patients. Without the special authorization given by this form, your doctor or treatment facility cannot disclose medical information that might be crucial to the enactment of your Living Will. 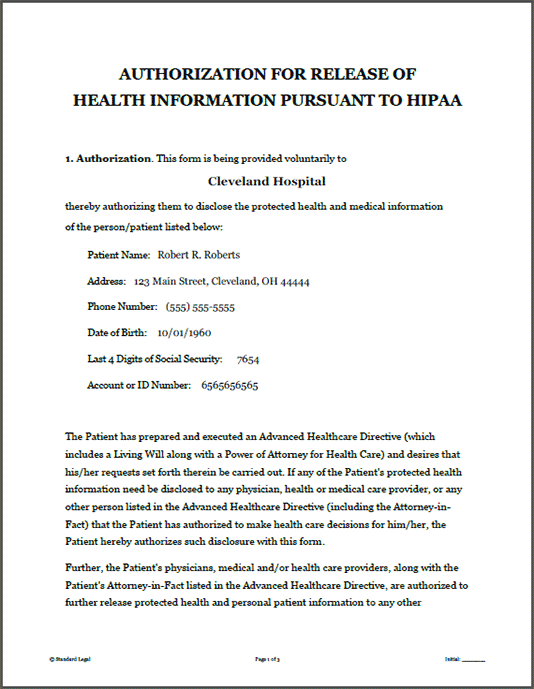 Without a proper HIPAA release, the persons that you appointed to act as your Agent might not be able to obtain the information necessary to enforce the wishes of your Healthcare Power of Attorney. Further, without the appropriate HIPAA release, medical facilities treating you may have difficulty obtaining your past medical information. This HIPAA release will allow medical information to be provided to your current doctors and hospitals, PLUS the person listed as your Agent in making health care decisions on your behalf. Finally, a Minor Child Emergency Healthcare Authorization Form is also included in this package. This form allows a parent or guardian to designate another responsible adult to make emergency healthcare decisions for a child if the primary guardian is not immediately available to do so. With all of these critical forms packaged together and provided in a format that is easy to use, the Standard Legal Living Will software program is a truly great value. Why leave your healthcare decisions to chance -- or let them be decided by some unnamed doctor, hospital bureaucrat or the state -- when you can make your intentions known without question quickly, easily and affordably! 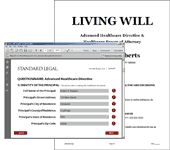 I purchased Standard Legal software in order to prepare a Will, a Power of Attorney and a Living Will for my ailing mother-in-law. 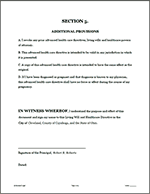 The forms were easy to use and I prepared the documents in a short period of time. Unfortunately, my mother-in-law died within 10 days of the forms being prepared and signed. The local hospital honored the Living Will forms, and the attorney who assisted me in probating her estate was impressed with the quality of the Will. The estate was probated without incident. I will be purchasing additional Standard Legal software in order to sell my mother-in-law's real estate. Your software saved me hundreds of dollars, so thank you! With a very sick father suffering from cancer, Standard Legal allowed me to get the appropriate legal documents prepared for him without my father ever having to leave the comfort of his home. Thanks, Standard Legal. I ordered two of your software titles. You guys did a SUPERB job. There's no way I can do this on my own without your included samples. Thank you! I would like to express my most sincere gratitude for this wonderful software. I was able to prepare my Last Will and Testament as well as my Living Will in a matter of minutes. Thanks for helping me save a lot of money. I will definitely recommend you to my family and friends. WOW!! Thanks for the prompt reply to my email. I'm impressed. I did software development for TRW for 40 years in missiles and weapons systems. I recognize and appreciate the quaility of your Will and Living Will products. And the great customer service, too!! After quite a number of years of procrastination, it was the compact, concise and very affordable Standard Legal documents that got me to complete my Will and Living Will. The price and service can't be better. Thanks for helping me get that important yet 'put-offable' task finished. FULLY SECURE PERSONAL DATA: Our software is downloaded then completed offline, not run through an online webform that transmits your data across the internet to be stored in a database. So your answers stay completely private and secure, and your personal data never leaves your hard drive! QUALIFIED ATTORNEY AUTHORS: All of the legal documents within each Standard Legal software title are carefully researched and written by highly-qualified, experienced, licensed attorneys. UP-TO-DATE LEGAL CONTENT: Documents and instructions are revised any time a state or federal law, statute or administrative requirement changes. Our legal forms content is in constant review! STEP-BY-STEP INSTRUCTIONS: Clear instructions are posted directly next to each question asked. No 'legal-eze' either! 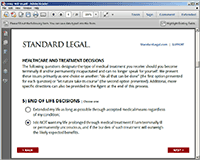 Standard Legal writes in a way that is "step-by-step" and easy to understand. IMMEDIATE ACCESS: Use the software right after purchase! Get encrypted links to a download within seconds, both on-screen with your order invoice and again as a backup in an email confirmation. 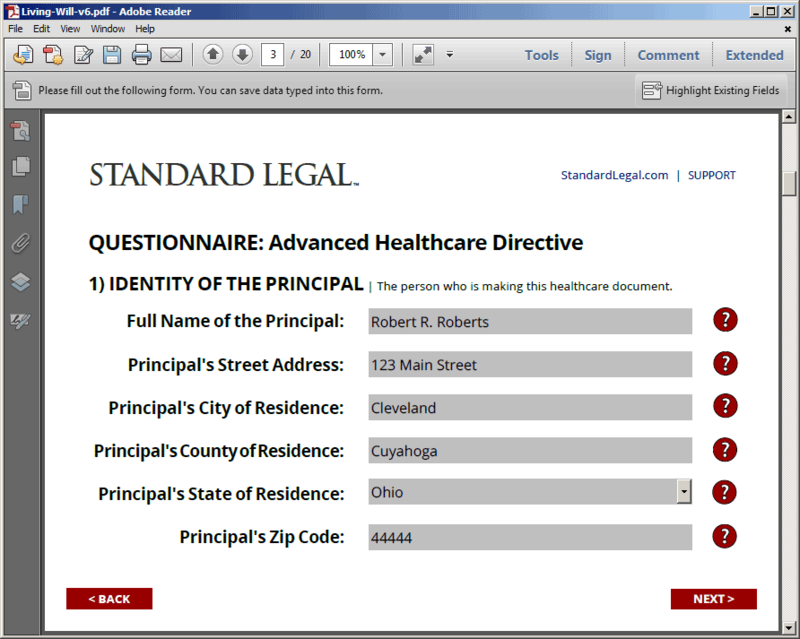 EASILY DOWNLOADABLE FORMS: Standard Legal's documents can be downloaded in one .zip file, with additional state-specific documents available from the online forms server. USE WITH ANY DEVICE: Windows, Mac, Apple, iPad, Android, Linux. Desktop PC, laptop, tablet, mobile device. Nearly any system can use the software from Standard Legal! FREE TECHNICAL SUPPORT: Standard Legal helps its clients in any way we can. While we cannot provide legal advice, we will gladly assist you by email, phone or social media to access and use our software. FREE ATTORNEY REFERRAL: If you decide that handling a situation yourself might not be wise, access our attorney referral site and find a qualified attorney to help you with your case. No charge to post your case! LEGAL & VALID IN ALL STATES: The documents from Standard Legal are valid in every USA state and territory. Primary documents cover federal law, with state-specific language or forms provided as required. SAVE MONEY ON LEGAL FEES: Quickly and easily create the same kinds of legal documents as a local attorney. And save hundreds -- sometimes even thousands -- of dollars in the process! 100% MONEY BACK GUARANTEE: Standard Legal guarantees that all of the documents in our software will be accepted when completed as directed and submitted to the appropriate court, clerk, office or agency. Should any document not be accepted due to an issue with our content, we will correct that document for you at once or refund 100% of the purchase price -- or both! Complete details here. Standard Legal software is PDF-based and works on virtually all Windows, Apple, Macintosh, Android and Linux-based PCs, laptops, tablets and mobile devices. 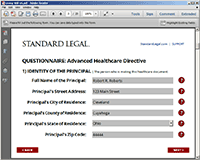 Using the FREE Adobe Reader, the legal documents are interactive PDFs featuring a questionnaire that converts the information you provide into a finished legal document. It is critical to use the most up-to-date version of Reader; if you already use Reader, see 'Help > Check for Updates' in the program's menu to get the latest version. The commercial version of Adobe Acrobat Pro can also be used to complete the forms. Adobe Reader should ALWAYS be used as a stand-alone program or mobile app and NEVER within a web browser. Links to a downloadable .zip file are presented immediately upon the completion of your order. This .zip must be expanded to access the PDF files. Most computers have an expansion program like WinZip pre-installed; if your computer does not have one, we recommend StuffIt Expander (it's FREE!). Once the file is downloaded, all documents within can be completed offline, no internet connection required. Read the START-HERE.txt file included in the initial download for more instructions. Access links to the downloadable .zip file and/or the online forms server for this title are available for one (1) year after the date of purchase, upon request. Files downloaded and saved to a device may be used without time limit, but new downloads are no longer accessible one year after the date of purchase. A discount code is available to past customers by email to make a new or updated purchase. To use any type of software requires a basic understanding of how a computer device operates. 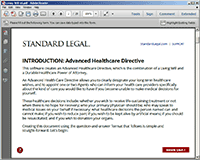 To use Standard Legal software, you must be able to complete these basic computer tasks: download a software file; expand a .zip file; enter a username and password to access a protected website; navigate a menu; install and launch a program; and open, save then print a completed document. If you do not fully understand how to complete any of these common steps, we recommend you use our Document Preparation Service or find a local attorney to create documents for you. WANT YOUR SOFTWARE ON A CD? A software CD of your legal form titles can be mailed to you for an additional $9.95 by choosing that shipping option during checkout. Software CD Details. ATTORNEYS, PARALEGALS AND DOCUMENT PREPARATION PROFESSIONALS: This software is licensed exclusively for pro se users. To create custom legal documents on behalf of clients, review our Professional Version software. Have a Living Will question?